The Graduate Record Exam is a standard requirement for most graduate schools. Once you have decided to further your education, you won’t want any delays, but the GRE can be a stumbling block if you aren’t prepared for it. In 100-120 hours, examPAL guarantees that you can be prepared to achieve your highest possible score on the GRE. examPAL GRE review ensures results with a tried-and-true testing system, lots of differentiated practice and consistent test-taker support. The examPAL GRE test prep program is designed with first-time test takers in mind as well as those hoping to improve upon a previous score. Each lesson within the examPAL GRE review is based on just one concept, with a great mix of teaching math principles, tips to make essays stronger, and quizzes throughout to test knowledge and problem solving skills along the way. The lessons are laid out in the format of a fun, interactive map. The concept of making study fun, known as gamification, requires users to achieve milestones before testing in those areas. examPAL clearly understands gamification and employs it to keep users motivated. The examPAL GRE review program is intuitive, thorough, and adaptive, and overall a really nice tool for a wide array of test takers. A diagnostic test determines your starting level, and the rest of the program is designed to meet you where you are while preparing you for the test with knowledge and testing skills that will help you answer GRE questions in a similar way to past successful test takers. There are 3 examPAL GRE plans to choose from and the differences are clear cut. As you can see below, GRE exam prep doesn’t come cheap. however, examPAL has plans to suit most budgets. The plans represented above are not only budget specific, but they are also geared toward the amount of time that you have before the test. With examPAL, GRE review can be 100% customized to your individual needs. The Express plan is $189 (Get Discount)and gives you 6 weeks of access to the site. This plan is perfect for anyone who would like a little extra insurance before taking the GRE for the first time. although there is no guarantee of a specific score with this package, it can definitely be beneficial study tool for concepts and test-taking strategies alike. Even with examPAL’s most basic plan, you’ll have access to all 1500 practice questions and get two complimentary essay reviews to improve your score on the analytical writing portion. 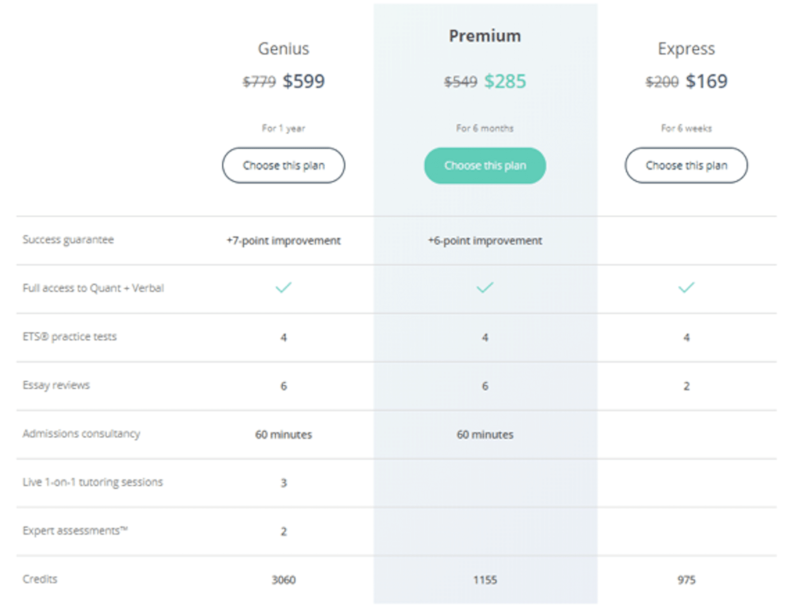 The Premium package offers the same tools as the Express and a few more, but for 6 months at $299 (Get Discount). The purchase of a Premium examPAL GRE prep course review package comes with a guarantee to improve your score by 6 points or more. You’ll also be able to submit up to 6 essays for review at the Premium level, which is great for those who need more help with the writing section than the Q&A portions. The Premium level also comes with a 60- minute admissions counseling session, so you won’t have to chart the unfamiliar waters of graduate school alone! The most expensive and comprehensive option that examPAL GRE has to offer is the Genius package. A one-time fee of $599 (Get Discount) grants you 1 year of access to study materials, videos, advice, and more. With this package, you are guaranteed to improve your score by 7 or more points. Three one-on-one tutoring sessions are included in that price, to be scheduled at your convenience. Each plan also comes with a designated amount of credits that may be applied to any extra services that you choose. Credits can be spent on extra tutoring, essay reviews, or expert assessment that will reveal your areas of strength and weakness where the test is concerned so you may focus on those more during the time you have left. Of the many different GRE prep materials available, examPAL GRE review is one of the best available according to unbiased sources as well as past satisfied customers. With 20+ years in test prep, it’s easy to see how examPAL’s GRE review tools are fine-tuned enough to guarantee results! examPAL GRE prep course review is highly rated for many reasons. The program offers a free 7-day trial as well as a 30-day money back guarantee for those still wondering if the actually need the extra practice. When you purchase a package from examPAL, one of the first things you’ll need to do is to set your test date. Once examPAL knows how long you have before you’ll take the test, the web-based application will plan your journey for you, spacing out your study hours evenly across the days or weeks you have left. With examPAL, you won’t find yourself cramming last minute as long as you follow the recommended course study schedule. 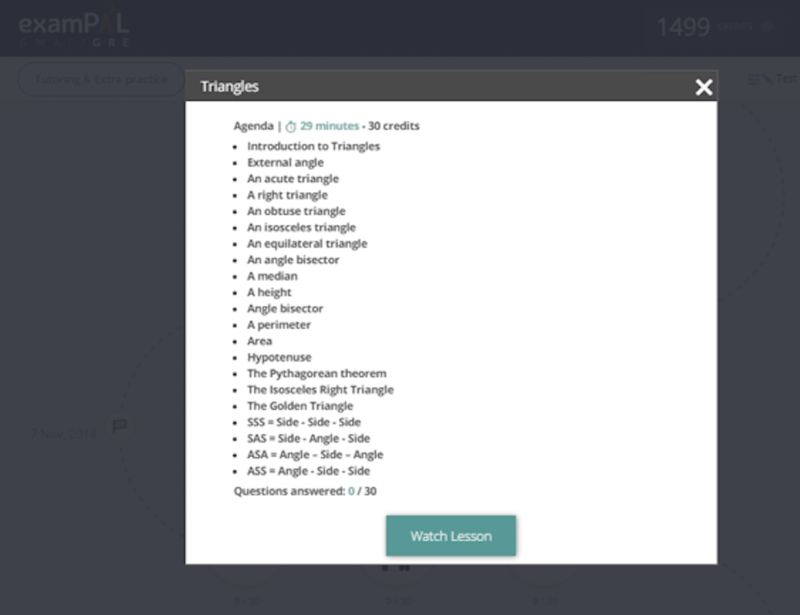 The program breaks each lesson down into separate videos and tests, so you’ll have lots of opportunities to take a break, and you won’t get bogged down in long lessons and lose interest. 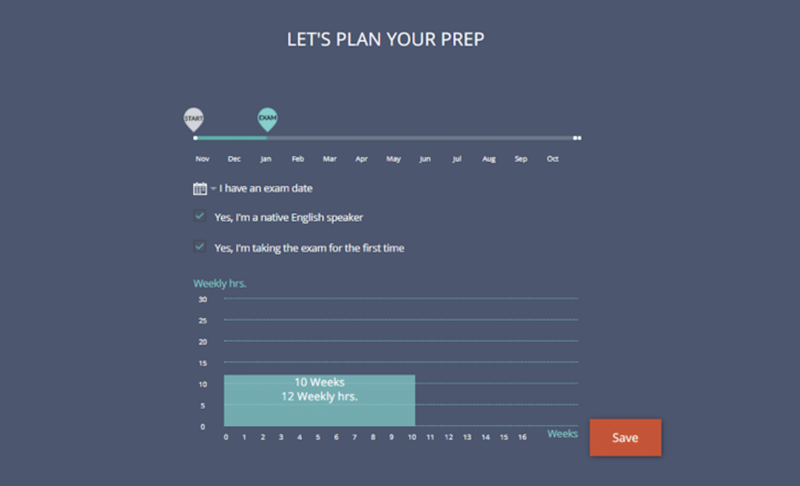 You can schedule your test for any time within you plan’s parameters. If you have a vacation, holiday, or some other event coming up before your test, you can plan to complete the material early so you won’t be stressing during family or personal time. The GRE asks potential graduate students to use critical thinking in the areas of verbal reasoning, quantitative reasoning, and analytical writing The GRE does not test knowledge or IQ. Instead, it tests one’s ability to figure out the simplest, fastest way to solve a problem. Knowing rules and test taking strategies can help you as much on this test as knowing answers to specific questions. This is where examPAL GRE review can be tremendously helpful. You’ll use the precise method when you have all the information and can actually solve the problem, like in the case of an algebraic equation. With this method, you don’t have to consider all the answer choices because you will be able to find the exact answer yourself. A precise tool or skill is needed in these instances to find the correct answer. For a problem that can be solved with the alternate method, you can plug in a number or word for a variable. The answer you are looking for is usually found in the answers provided, which means you can plug each one in and use process of elimination to rule out the ones that won’t work. The logical method uses rules and facts to help test takers choose the correct answer, sometimes without doing any figuring or solving. This method is good for questions that test your knowledge of mathematic qualities. By simply applying a rule you know, you can determine if a statement makes sense. These strategies are useful when practicing for the test. Knowing how to approach each question can save you time and stress while preparing and during the actual test. We have discussed the setup of examPAL’s review product in general. Now let’s look at it in a little more detail. Each examPAL GRE lesson is anywhere from 10 to 40 minutes long. The majority are within 15 t0 25 minutes. You will see the time requirement along with the concepts that will be covered when you click on “Agenda” in the dashboard. The first thing you’ll see is PAL 101. Within this subsection, there are two videos: Introduction to PAL and Introduction to GRE. Both of these informative videos give helpful information about to the examPAL program and to the GRE test itself. Whether you have taken the GRE before or if you will be taking the test for the first time, we recommend watching both videos because they give helpful insights about the logic behind the test and the skills that are truly needed to be successful on the GRE. This section of the examPAL GRE prep material provides pertinent definitions, examples, and tricks that will be helpful in the particular section. You’ll see both “the short way” (memorization of rules and methods), but also “the long way” (a detailed explanation) of how to solve many practice questions. Once users have reviewed the basic principles, they can move on to the meat of the lesson. The next video in the series has explanations of right and wrong answers so that you can not only see what the correct answer is, but internalize the fastest, simplest way to reach that answer. The video pauses after each explanation and restarts on your click so that you can take as much time as you need to digest the information. The final section of each lesson is a set of practice questions pulled from a bank of 1500 unique GRE-based test questions. 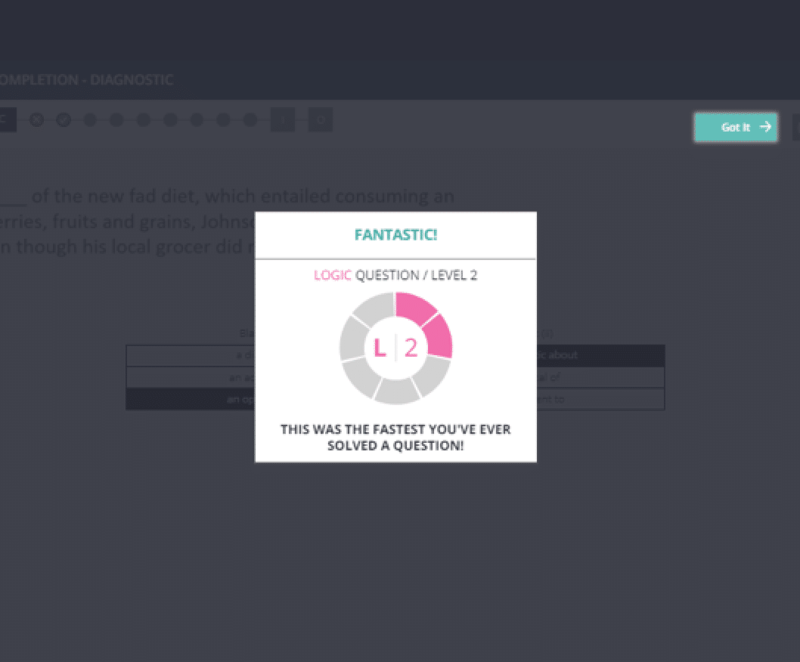 A diagnostic quiz taken first aptly determines each user’s unique starting point, so each person will see questions that are tailored to his or her current skill/knowledge level. Tests will be user-optimized as you go, giving users practice based on the way they think and the type of questions they need more practice on. 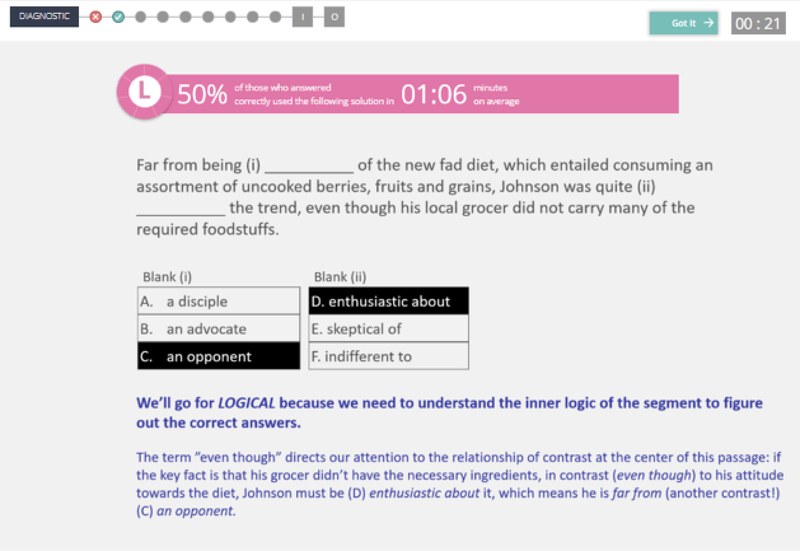 In the practice tests, the answer is graded immediately, and the user can also see what type of question it is (logic, etc.) and what level it is. Then, you will be provided with solutions that others used to solve the questions quickly. Unique statistics, such as how long it took others to solve the problem and how many got it right using the provided strategy, will give you a better idea of how to solve similar questions in the future. Along the way, you’ll get purely test taking strategy videos without a quiz attached. These lessons give valuable information about vocabulary, memorization, analytical writing, and more. This information includes how much time is permitted for each section and the specific skills that are being assessed, especially in the analytical writing section. These examPAL GRE prep course review sections aren’t tested. They are simply helpful information that can give users an edge on test day. Private Tutor – You can schedule a one-hour, one-on-one tutoring session via Skype, even if you have the Express or Premium packages, neither of which include tutoring. This option is good for students who are getting close to their test date and need additional reinforcement as well as those who need personalized test-taking strategies. Expert Assessment – If you feel overwhelmed and don’t know where to start, you can purchase an expert assessment assistance with your credits. examPAL experts will analyze your progress and tell you what your weaker areas are and how to address them. Expert Assessment is a great way to find out where you stand when you’re about half way through the examPAL GRE review coursework, and it’s a good tool for anyone retaking the test. Submit an Essay – Those who struggle to produce complete, concise, error-free writing can get extra help with examPAL’s 3 levels of assistance: Score, Score & Summary, or Full Review. At all three levels, you will get a quantitative score report provided by a real person, not a computer program. The higher levels provide more detailed, specific information. The benefits for examPAL customers don’t end there, though. There are special loans, grants, and scholarships for examPAL users, all of which can be accessed through their website. examPAL GRE review tool is arguably one of the best test prep tools on the market, with only minor limitations. 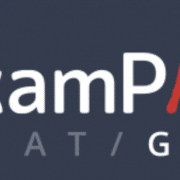 Users must have an internet connection to access their study materials with examPAL, and the size of the practice question bank is small compared to other study tools (1500 questions compared to some programs’ 5000 questions). Overall, though, examPAL GRE is a quality product for the price – with strong money-back and score-improvement guarantees. It’s worth consideration as a top GRE prep option. TAKE ME TO EXAMPAL GRE!